Mask for hair strengthening and growth is enriched with vitamins, extracts and oils, which brilliantly strengthen hair, prevent falling out of hair and stimulate its growth. Extract of peloids has a positive effect on the immune system of the head skin. 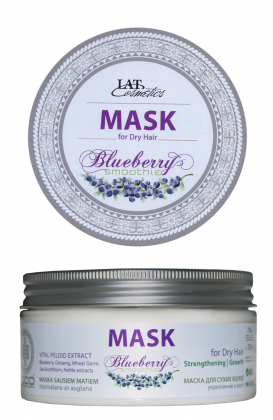 When applied regularly, the mask accelerates hair growth and prevents its splitting. Application: apply to clean, moist hair evenly distributing it to the whole length of hair. Leave it in for approximately 5 -10 minutes, then rinse off thoroughly with warm water. Avoid getting of the mask into eyes. If it happens, rinse it with water. Contraindications: individual intolerance. Store in a dry, dark place, at the temperature of +5°C up to +25°C. Keep out of reach of children. Ingredients: Aqua, Cetearyl Alcohol, Behentrimonium Chloride, Crambe Abyssinica Seed Oil Phytosterol Esters, Butyrospermum Parkii Butter, Guar Hydroxypropyltrimonium Chloride, Limus Extract, Vaccinium Myrtillus Fruit Extract, Panax Ginseng Root Extract, Urtica Dioica Leaf Extract, Triticum Aestivum Germ Extract, Hippophae Rhamnoides Fruit Extract, Tocopheryl Acetate, Glyceryl Linoleate (and) Glyceryl Linolenate, Citric Acid, Phenoxyethanol (and) Ethylhexylglycerin, Parfum.